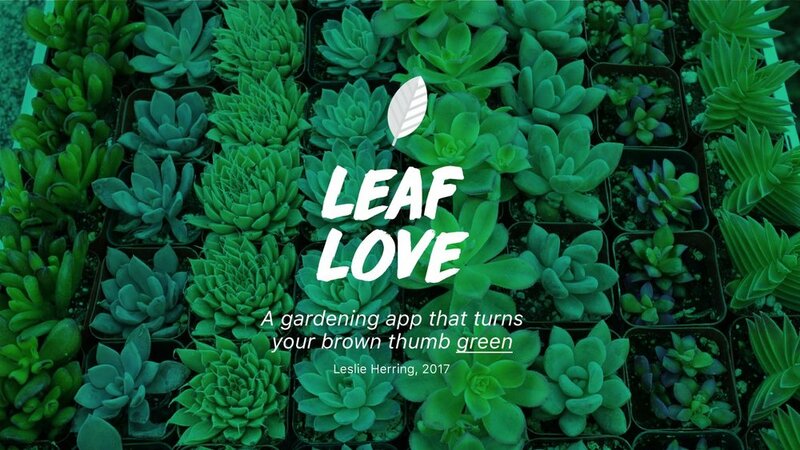 Leaf Love is a gardening app that turns your brown thumb green. Nature brings joy and relaxation to many of us. Plants purify our air, make our world beautiful, and provide for us. We literally need them to survive. Not all of us are in tune with nature. For example, I’ve killed everything from cactus to bamboo. Some of us simply have brown thumbs. Plants often don’t let you know when the need to be watered, re-potted, fertilized, or if they’ve had too much sun. They simply die. This made me think that people may need more helpful tools to prompt them to take care of their plants. The Goals of my research were to find out which apps existed, what was successful about them and how to make taking care of plants easy. With User interviews, the goal was to find not only why people have a hard time taking care of their plants, and the different ways they feel overwhelmed by the task, but to also find out what did motivate them to get things done. I conducted a competitive analysis comparing features of currently available plant care apps, as well as task managing and game apps. User interviews were conducted, in person as well as through video chat. I created a discussion guide so that I could jump to questions I wanted to ask as the natural conversation flowed, as well as ask additional questions when something new and interesting was said. Also, some interviewees were able to quickly show me their current garden setup. A streamlined task list app. Great for making lists and organizing them, but doesn’t have any specific plant information or ability to tap into conditions outside the app. An app that urges users to stand at least once per hour for rewards such as avatars and landscapes within the game. A plant monitoring app that is paired with a smart device. App hasn’t been updated in two years. This app does give you notifications without using their smart device. A plant monitoring app is paired with a smart device. Plant database is small and notifications don’t work without the device. A plant monitoring app that is paired with a smart device. You can’t use any features of the app without the device. It’s super cute, though. A habit forming task management app. With RPG gamification, this app helps give those who love games incentive to take on their real life tasks. It just has nothing to do with plants. Many current apps are out of date, no longer supported. Task managers & habit tracking apps to not account for specific basic plant needs. Many plant care apps only work with their specific smart device. Most plant care apps don’t create additional motivation for long term plant care. Gamification can be as simple as checking in, or performing a task for points. What types of things motivate them, such as Personal Achievement, Guilt, Positive/Negative Reinforcement, Financial incentives, Task Lists, Alerts, or Social Connection. I suspect people may need more helpful tools to prompt & create incentive for them to take care of their plants. With the findings from the User interviews, I changed the main navigation bar to surface finding plant information, and changed the home page notification area to a "load more" button. I also added a button at the bottom of the long scrolling area of the plant care page so that people could naturally click it after learning more about the plant. The main thing I learned from both interviews and testing is that gamification is widely recognized as well as highly capable of creating incentive to the user. Creating a robust plant tracking app is enough, but in order to make plant care habit forming, there has to be additional incentive. Also, a quick way to log tasks from the menu bar was unnecessary, as users knew to log tasks from the home screen. Adding buttons at the bottom of long information made navigating the app easier. To make sure the app is working as intended, next steps are to perform more usability tests with the revised wireframes. Additionally, more features such as social sharing, and a possibility of affiliate integration to create real rewards could be explored. The gamification part of the app needs more thought and testing.